For other uses, see The Three Musketeers (disambiguation). For the novel's film adaptations, see The Three Musketeers in film. "D'Artagnan, Athos, Aramis, and Porthos"
Situated between 1625 and 1628, it recounts the adventures of a young man named d'Artagnan (based on Charles de Batz-Castelmore d'Artagnan) after he leaves home to travel to Paris, to join the Musketeers of the Guard. Although d'Artagnan is not able to join this elite corps immediately, he befriends the three most formidable musketeers of the age – Athos, Porthos and Aramis, "the three inseparables," as these are called – and gets involved in affairs of the state and court. In genre, The Three Musketeers is primarily a historical and adventure novel. However, Dumas also frequently works into the plot various injustices, abuses, and absurdities of the old regime, giving the novel an additional political aspect at a time when the debate in France between republicans and monarchists was still fierce. The story was first serialised from March to July 1844, during the July Monarchy, four years before the French Revolution of 1848 violently established the Second Republic. The story of d'Artagnan is continued in Twenty Years After and The Vicomte of Bragelonne: Ten Years Later. In the meanwhile, since godfathers are second fathers, as it were, we beg the reader to lay to our account, and not to that of the Comte de la Fère, the pleasure or the ennui he may experience. This being understood, let us proceed with our story. Following Dumas's lead in his preface, Eugène d'Auriac (de la Bibliothèque Royale) in 1847 was able to write the biography of d'Artagnan: d'Artagnan, Capitaine-Lieutenant des Mousquetaires– Sa vie aventureuse– Ses duels– etc. based on Courtilz de Sandras. The Three Musketeers was written in collaboration with Auguste Maquet, who also worked with Dumas on its sequels (Twenty Years After and The Vicomte of Bragelonne: Ten Years Later), as well as The Count of Monte Cristo. Maquet would suggest plot outlines after doing historical research; Dumas then expanded the plot, removing some characters, including new ones, and imbuing the story with his unmistakable style. In 1625 France, d'Artagnan (a poor young nobleman) leaves his family in Gascony and travels to Paris to join the Musketeers of the Guard. At a house in Meung-sur-Loire, an older man derides d'Artagnan's horse. Insulted, d'Artagnan demands a duel. But the older man's companions instead beat d'Artagnan unconscious with a cooking pot and a metal tong that breaks his sword. His letter of introduction to Monsieur de Tréville, the commander of the Musketeers, is also stolen. D'Artagnan resolves to avenge himself upon the older man, who is later revealed to be the Comte de Rochefort, an agent of Cardinal Richelieu, who is passing orders from the Cardinal to his spy, Lady de Winter, usually called Milady de Winter or simply "Milady". In Paris, d'Artagnan visits M. de Tréville at the headquarters of the Musketeers, but without the letter, Tréville politely refuses his application. He does, however, write a letter of introduction to an academy for young gentlemen which may prepare his visitor for recruitment at a later time. From Tréville's window, d'Artagnan sees Rochefort passing in the street below and rushes out of the building to confront him, but in doing so he offends three Musketeers, Athos, Porthos, and Aramis, who each demand satisfaction; d'Artagnan must fight a duel with all of them that afternoon. As d'Artagnan prepares himself for the first duel, he realizes that Athos's seconds are Porthos and Aramis, who are astonished that the young Gascon intends to duel them all. 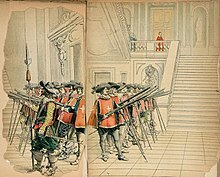 As d'Artagnan and Athos begin, Cardinal Richelieu's guards appear and attempt to arrest d'Artagnan and the three Musketeers for illegal dueling. Although they are outnumbered, the four men win the battle. D'Artagnan seriously wounds Jussac, one of the Cardinal's officers and a renowned fighter. After learning of this, King Louis XIII appoints d'Artagnan to Des Essart's company of the King's Guards and gives him forty pistoles, a kind of gold coin. D'Artagnan hires a servant named Planchet, finds lodgings, and reports to Monsieur des Essart, whose company is a less prestigious regiment in which he will have to serve for two years before being considered for the Musketeers. Shortly after, his landlord speaks to him about the kidnapping of his wife, Constance Bonacieux. When she is presently released, d'Artagnan falls in love at first sight with her. She works for Queen Anne of France, who is secretly conducting an affair with the English Duke of Buckingham. The King, Louis XIII, gave the Queen a gift of diamond studs, but she gives them to her lover as a keepsake. Cardinal Richelieu, who wants war between France and England, plans to expose the tryst and persuades the King to demand the Queen wear the diamonds to a soirée that the Cardinal is sponsoring. Constance tries to send her husband to London, but the man is instead manipulated by Richelieu and thus does not go, so d'Artagnan and his friends intercede. En route, the Cardinal's henchmen repeatedly attack them and only d'Artagnan and Planchet reach London. Before arriving, d'Artagnan is compelled to assault, and nearly to kill, the Comte de Wardes, a friend of the Cardinal, cousin of Rochefort and Milady's lover. Although Milady stole two of the diamond studs, the Duke of Buckingham provides replacements while delaying the thief's return to Paris. D'Artagnan is thus able to return a complete set of jewels to Queen Anne just in time to save her honour. In gratitude, she gives him a beautiful ring. Shortly afterwards, d'Artagnan begins an affair with Madame Bonacieux. Arriving for an assignation, he sees signs of a struggle and discovers that Rochefort and M. Bonacieux, acting under the orders of the Cardinal, have assaulted and imprisoned her. D'Artagnan and his friends, now recovered from their injuries, return to Paris. D'Artagnan meets Milady de Winter officially, and recognizes her as one of the Cardinal's agents, but becomes infatuated with her until her maid reveals that Milady is indifferent toward him. Entering her quarters in the dark, he pretends to be the Comte de Wardes and trysts with her. He finds a fleur-de-lis branded on Milady's shoulder, marking her as a felon. Discovering his identity, Milady attempts to kill him but d'Artagnan eludes her. He is ordered to the Siege of La Rochelle. He is informed that the Queen has rescued Constance from prison. In an inn, the musketeers overhear the Cardinal asking Milady to murder the Duke of Buckingham, a supporter of the Protestant rebels at La Rochelle who has sent troops to assist them. Richelieu gives her a letter that excuses her actions as under orders from the Cardinal himself, but Athos takes it. The next morning, Athos bets that he, d'Artagnan, Porthos, and Aramis, and their servants can hold the recaptured St. Gervais bastion against the rebels for an hour, for the purpose of discussing their next course of action. They resist for an hour and a half before retreating, killing 22 Rochellese in total. They warn Lord de Winter and the Duke of Buckingham. Milady is imprisoned on arrival in England, but she seduces her guard, Felton (a fictionalization of the real John Felton), and persuades him to allow her escape and to kill Buckingham himself. On her return to France, Milady hides in a convent where Constance is also staying. The naïve Constance clings to Milady, who sees a chance for revenge on d'Artagnan, and fatally poisons Constance before d'Artagnan can rescue her. The Musketeers arrest Milady before she reaches Cardinal Richelieu. They bring an official executioner, put her on trial and sentence her to death. After her execution, the four friends return to the Siege of La Rochelle. The Comte de Rochefort arrests d'Artagnan and takes him to the Cardinal. When questioned about Milady's execution, d'Artagnan presents her letter of pardon as his own. Impressed with d'Artagnan's willfulness and secretly glad to be rid of Milady, the Cardinal destroys the letter and writes a new order, giving the bearer a promotion to lieutenant in the Tréville company of Musketeers, leaving the name blank. D'Artagnan offers the letter to Athos, Porthos, and Aramis in turn but each refuses it; Athos because it is below him, Porthos because he is retiring to marry his wealthy mistress, and Aramis because he is joining the priesthood. D'Artagnan, though heartbroken and full of regrets, finally receives the promotion he had coveted. Athos – Comte de la Fère: he has never recovered from his marriage to Milady and seeks solace in wine. He becomes a father figure to d'Artagnan. Aramis – René d'Herblay, a handsome young man who hesitates between his religious calling and his fondness for women and scheming. Porthos – M. du Vallon: a dandy, fond of fashionable clothes and keen to make a fortune for himself. The least cerebral of the quartet, he compensates with his homeric strength of body and character. D'Artagnan – Charles de Batz de Castelmore d'Artagnan: a young, foolhardy, brave and clever man seeking his fortune in Paris. Planchet – a young man from Picardy, he is seen by Porthos on the Pont de la Tournelle spitting into the river below. Porthos takes this as a sign of good character and hires him on the spot to serve d'Artagnan. He turns out to be a brave, intelligent and loyal servant. Grimaud – a Breton. Athos is a strict master, and only permits his servant to speak in emergencies; he mostly communicates through sign language. Mousqueton – originally a Norman named Boniface; Porthos, however, changes his name to one that sounds better. He is a would-be dandy, just as vain as his master. In lieu of pay, he is clothed and lodged in a manner superior to that usual for servants, dressing grandly in his master's old clothes. Bazin – from the province of Berry, Bazin is a pious man who waits for the day his master (Aramis) will join the church, as he has always dreamed of serving a priest. Milady de Winter – a beautiful and evil spy of the Cardinal, she is also Athos's ex-wife. D'Artagnan impersonates a rival to spend a night with her, attracting her deadly hatred. Rochefort is a more conventional agent of the Cardinal. Following their duel on the road to Paris, d'Artagnan swears to have his revenge. He loses several opportunities, but their paths finally cross again towards the end of the novel. Constance Bonacieux – the Queen's seamstress and confidante. After d'Artagnan rescues her from the Cardinal's guard, he immediately falls in love with her. She appreciates his protection, but the relationship is never consummated. Monsieur Bonacieux – Constance's husband. He initially enlists d'Artagnan's help to rescue his wife from the Cardinal's guards, but when he himself is arrested, he and the Cardinal discover they have an understanding. Richelieu turns Monsieur Bonacieux against his wife, and he goes on to play a role in her abduction. Kitty – a servant of Milady de Winter. She dislikes her mistress and adores d'Artagnan. Lord Winter - brother of Milady's second husband, who died of a mysterious disease (apparently poisoned by Milady). He imprisoned Milady upon her arrival in England and decided to send her overseas in exile. Later, he took part in Milady's trial. King Louis XIII of France: presented by Dumas as a fairly weak monarch often manipulated by his chief minister. Queen Anne of Austria – the unhappy Queen of France. Cardinal Richelieu: Armand Jean du Plessis, the King's chief minister, who plots against the Queen in resentment at having his advances rebuffed. Dumas describes him as being "36 or 37" though in 1625 Richelieu was 40. 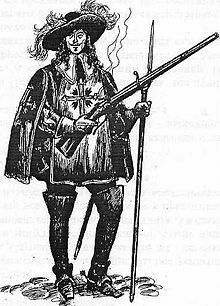 M. de Tréville – captain of The Musketeers, and something of a mentor to d'Artagnan, though he has only a minor role. George Villiers, 1st Duke of Buckingham - a handsome and charismatic man used to getting his way: he thinks nothing of starting a war between England and France for his personal convenience. His courtship of Anne of Austria gets her in trouble. John Felton – a puritan officer assigned to guard Milady and warned about her ways, he is nonetheless seduced and fooled by her in a matter of days and assassinates Buckingham at her request. Les Trois Mousquetaires was translated into three English versions by 1846. One of these, by William Barrow (1817–1877), is still in print and fairly faithful to the original, available in the Oxford World's Classics 1999 edition. To conform to 19th-century English standards, all of the explicit and many of the implicit references to sexuality were removed, adversely affecting the readability of several scenes, such as the scenes between d'Artagnan and Milady. The most recent English translation is by Richard Pevear (2006), who, though applauding Barrow's work, states that most of the modern translations available today are "textbook examples of bad translation practices" which "give their readers an extremely distorted notion of Dumas' writing". The novel has been adapted also for television in live-action and animation. BBC has adapted the novel in three separate occasions. The Musketeers, a 2014 series by Adrian Hodges, is the newest BBC adaptation starring Tom Burke, Santiago Cabrera, Howard Charles and Luke Pasqualino as the titular musketeers. The Young Blades is an American/Canadian television series that aired on PAX on 2005. It's a sequel to the novels, centered on the son of d'Artagnan, played by Tobias Mehler. Walt Disney Productions produced a Silly Symphony cartoon called, Three Blind Mouseketeers, which is loosely based on the novel in 1936, in which the characters are depicted as anthropomorphic animals. Dogtanian and the Three Muskehounds is a 1981 Spanish–Japanese anime adaptation, where the characters are anthropomorphic dogs. A sequel, The Return of Dogtanian, was released in 1989 by BRB Internacional, Thames Television and Wang Film Productions. Set 10 years after of the original, it's loosely based on the novel The Vicomte de Bragelonne. A key difference between the two Dogtanian adaptions and Dumas' novel is that the character traits of Athos and Porthos were interchanged, making Athos the extrovert and Porthos the secretive noble of the group. In 1989, Gakken produced a new anime adaptation called The Three Musketeers Anime, this time with human characters, which features several departures from the original. The Three Musketeers was a series of animated shorts produced by Hanna-Barbera's as part of The Banana Splits Comedy-Adventure Hour and The Banana Splits & Friends show. Albert the Fifth Musketeer is a 1994 French animated series featuring a new musketeer, the titular Albert. Mickey, Donald, Goofy: The Three Musketeers, a direct-to-video animated movie produced by Walt Disney Pictures and the Australian office of DisneyToon Studios, directed by Donovan Cook, and released on August 17, 2004. A Barbie adaption of the tale by the name of Barbie and the Three Musketeers was made in 2009. 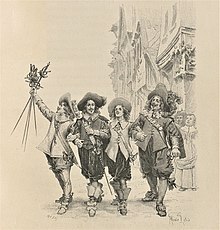 The first stage production was in Dumas' own lifetime as the opera Les Trois Mousquetaires with a libretto by Dumas himself and music by Albert Visetti. The Three Musketeers is a musical with a book by William Anthony McGuire, lyrics by Clifford Grey and P. G. Wodehouse, and music by Rudolf Friml. The original 1928 production ran on Broadway for 318 performances. A 1984 revival ran for 15 previews and 9 performances. In 2003, a Dutch musical 3 Musketiers with a book by André Breedland and music & lyrics by Rob & Ferdi Bolland premiered, which went on to open in Germany (both the Dutch and German production starring Pia Douwes as Milady De Winter) and Hungary. Playwright Peter Raby, composer George Stiles and lyricist Paul Leigh have written another adaptation titled "The 3 Musketeers, One Musical For All", originally produced by the now defunct American Musical Theatre of San Jose. In 2006, an adaptation by Ken Ludwig premiered at the Bristol Old Vic. In this version, d'Artagnan's sister Sabine, "the quintessential tomboy," poses as a young man and participates in her brother's adventures. In 2018 The Dukes performed an outdoor promenade production in Williamson Park, Lancaster, adapted by Hattie Naylor: in this version d'Artagnan was a young woman aspiring to be a musketeer. 1995 saw the release by publisher U.S. Gold of Touché: The Adventures of the Fifth Musketeer by video game developers Clipper Software, a classic point-and-click adventure game. In 2005, Swedish developer Legendo Entertainment published the side-scrolling platform game The Three Musketeers for Windows XP and Windows Vista. In July 2009, a version of the game was released for WiiWare in North America and Europe under the title The Three Musketeers: One for All!. In 2009, Canadian developer Dingo Games self-published The Three Musketeers: The Game for Windows and Mac OS X. It is the first game to be truly based on the novel (in that it closely follows the novel's story). 2009 also saw the publication of the asymmetric team board game The Three Musketeers "The Queen's Pendants" (Настольная игра "Три мушкетера") from French designer Pascal Bernard by the Russian publisher Zvezda. In 2010 a co-operative game called "Mousquetaires du Roy" was released by Ystari and Rio Grande. The alternative spelling of "Roy" was taken from the old French and is rumoured to be preferred over the regular spelling because the publisher's desire to have a letter "Y" in the name of the games they publish. Designed by François Combe and Gilles Lehmann for 1-5 players, the medium heavy game depicts the quest to retrieve the Queen's diamonds, while at the same time fending off disasters back in Paris. A sixth player expansion, called "Treville" was also made available in 2010. In 2010, Anuman Interactive launched The Three Musketeers, a hidden object game on PC and MAC. Players follow d'Artagnan in his quest to become a king's musketeer. In 2016, KindaTV launched a web series based on the story of The Three Musketeers, called "All For One". It follows a group of college students, mainly Dorothy Castlemore, and is centred around a sorority- Mu Sigma Theta (MST). The majority of characters have been gender-swapped from the original story and most character names are based on the original characters. It covers several themes including the LGBT community, mental health, long distance relationships and college life. 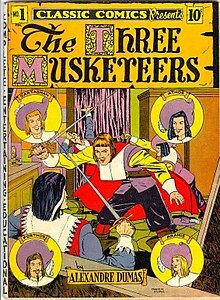 Publisher Albert Lewis Kanter (1897–1973), created Classic Comics for Elliot Publishing Company in 1941 with its debut issues being The Three Musketeers. The Three Mouseketeers was the title of two separate series produced by DC Comics; the first series was a loose parody of The Three Musketeers. In 1939, American author Tiffany Thayer published a book titled Three Musketeers (Thayer, 1939). This is a re-telling of the story in Thayer's words, true to the original plot but told in a different order and with different points of view and emphasis from the original. The Khaavren Romances by Steven Brust are fantasy (or science-fiction) novels heavily influenced by The Three Musketeers and its sequels; the characters and social background are closer to Dumas's than the plots. Tansy Rayner Roberts wrote Musketeer Space, a space opera retelling of the original book in which almost all characters have a different gender, as a weekly serialized novel from 2014-2016. In the book The Assault, The Three Musketeers is quoted in the Prologue as the protagonist had the story read to him by Mr. Beumer, a lawyer who later becomes senile and in morbidity. ^ Les Trois Mousquetaires by Alexandre Dumas – Free Ebook : Author's Preface. Gutenberg.org. 4 November 2004. Retrieved 26 February 2014. ^ Strecker, Erin (1 August 2012). "One for all: BBC announces new show 'The Musketeers'". Entertainment Weekly. Retrieved 1 August 2012. ^ "Ken Ludwig - Playwright: The Three Musketeers". www.kenludwig.com. Retrieved 28 December 2018. ^ Bartlett, Chris (24 July 2018). "The Three Musketeers review at Williamson Park, Lancaster – 'slick and inclusive open-air theatre'". The Stage. Retrieved 25 July 2018. ^ Brennan, Clare (22 July 2018). "The Three Musketeers review - a joyful twist on the classic swashbuckler". The Observer. Retrieved 25 July 2018. ^ "The Three Musketeers: One for All! (WiiWare)". Nintendo Life. Retrieved 18 January 2010. ^ "Pascal Bernard – Board Game Designer". BoardGameGeek. Retrieved 18 January 2010. ^ Звезда. Настольные игры. Сборные модели и миниатюры. (in Russian). Zvezda. Retrieved 18 January 2010. ^ "Mousquetaires du Roy". BoardGameGeek. Retrieved 15 March 2018. ^ "1st Ystari Game where the S comes before the Y?". BoardGameGeek. Retrieved 15 March 2018. ^ "Mousquetaires du Roy: Tréville miniature". BoardGameGeek. Retrieved 15 March 2018. ^ "HdO Adventure series | GamesIndustry International". Gamesindustry.biz. 18 March 2010. Retrieved 29 June 2014. Wikimedia Commons has media related to Les Trois Mousquetaires. The Three Musketeers at Project Gutenberg. Plain text format.